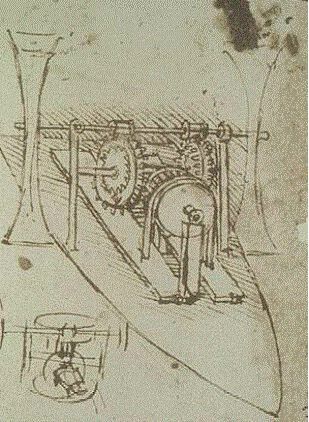 Leonardo da Vinci, PADDLE BOAT - Codex Atlanticus, folio 945 r. Drawing from: "Il Codice Atlantico di Leonardo da Vinci nella biblioteca Ambrosiana di Milano, Editore Milano Hoepli 1894-1904". For further details read: Ben Meftah M., De Serio F., Mossa M. and Pollio A., 2007, Analysis of the velocity field in a large rectangular channel with lateral shockwave, Environmental Fluid Mechanics, Vol. 7, No. 5. Hydraulic jump with oblique shock wave in the very large channel of the LIC (4m wide). In this research we describe the main characteristics of the velocity field of hydraulic jumps in a very large channel where lateral shockwaves occur. Experiments have been carried out at the Coastal Engineering Laboratory of the Water Engineering and Chemistry Department of the Technical University of Bari (Italy). Extensive flow velocity measurements were investigated in order to have a clearer understanding of both hydraulic jump development and lateral shockwave formation in a very large channel. 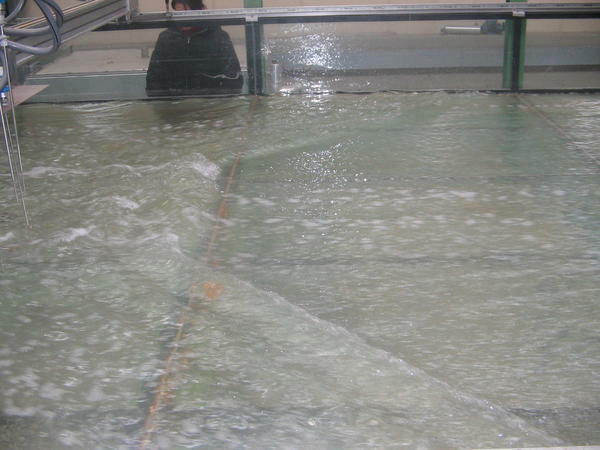 Experiments are performed in a 4m wide rectangular channel; the experiments differ in the inlet Froude number and the jump type. The flow velocity and the flow free surface measurements have been taken using a two-dimensional Acoustic Doppler Velocimeter (ADV) and an ultrasonic profiler, respectively. In this research topic we have investigated also the oscillating characteristics and cyclic mechanism of hydraulic jumps, analyzing the vortex roll-up process and the fluctuations of the longitudinal jump toe.